Houghton Mifflin Harcourt, 9780544716940, 304pp. One of Science News' "Favorite Books of the Year"
"An essential start to educating the public...reveal[s] the complex, interlocking, and thoroughly international nature of today’s bioscience...CRISPR heralds a new era of massively increased human control over life, one that will affect every person on Earth, directly or indirectly, and much of the rest of our planet’s biosphere. If humans are to have any chance of harnessing its benefits, avoiding its risks, and using it in ways consistent with our values and cultures, then we all — not just the scientists, ethicists, and patent lawyers — need to understand something about CRISPR and its implications. A Crack in Creation is a great place to start." "An invaluable account, by Doudna and Samuel Sternberg, of their role in the revolution that is genome editing...It is unusual to have a popular account of a great scientific breakthrough written by the protagonist, so soon after its discovery. Watson’s The Double Helix appeared 15 years after the work. We owe Doudna several times over – for her discovery, for her zeal to take it from the lab into the clinic, for her involvement in the ethical issues raised, for her public engagement work, and now for this book. It’s a fine weapon against the still far too large tribe of those who don’t believe in the power of very small things." "[A Crack in Creation] opens with the stark observation that the revolution in gene editing launched by CRISPR 'offers both the greatest promise and, arguably, the greatest peril for the future of humanity.' The first half of the book is a history of CRISPR’s development and a lucid explication of how it works. The authors describe the electrifying atmosphere of a laboratory at the front edge of discovery, while generously distributing credit to the legion of scientists who preceded Doudna and Chapentier or have carried their work forward...The book’s second half is an examination of CRISPR’s great potential to eliminate or cure disease and improve human existence in myriad ways, and of the perils it poses for humanity’s future." "[A Crack in Creation] contribute[s] to a public understanding of CRISPR, explaining science in terms that are understandable for the general reader...Fascinating." 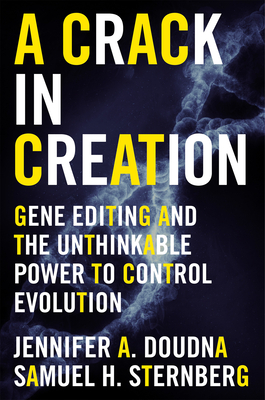 "A Crack in Creation chronicles the origin and potential application of CRISPR, the powerful new gene-editing technique that established Doudna as a household name in scientific circles...The first section begins with a history of gene-editing technology and how these research endeavors were largely propelled by the quest to eradicate genetic diseases...Reviewing the fundamentals will enable your imagination to unspool. You'll find yourself pausing to plot your own CRISPR-inspired science project—or science fiction scenario...In the second half of the book, the authors outline the staggering potential applications of CRISPR technology...The narrative between the lines that propels the book forward."